Work for Microsoft OneDrive for Business? "It works pretty well, but we prefer dropbox"
"It works throughout multiple devices"
"It's a good storage tool, but it could be better." One of the features that I benefit most from onedrive is that it allows me to transfer files from my PC to my phone without the need to connect them with a USB cable and since ondrive is integrated with the applications of Microsft Office, it greatly facilitates the handling of files made in programs like Word or PowerPoint, but also the version for companies can also be integrated with other programs such as Microsoft Planner, Microsoft Forms and Microsoft Teams. It is very useful to use it as backup of the files that we have in the pc. What I do not like is that it does not have enough collaboration tools, it is very basic in this sense and in comparison with other file sharing platforms I find that the price is a bit expensive. It is a good platform but it can still improve more. It is a good platform especially to maintain backup of your files in the cloud, however it is a bit expensive so if you have a small budget we recommend you consider other lower cost platforms. Basically the main use that has been given to onedrive more than everything has been to use it as backup of our hard drives. Which we can access from any of our mobile or desktop devices. In this aspect the onedrive security level is very good. "Amazing to share and easy to use!" One of the most helpful things of the program, is how easy you can access it, getting through a simple and light interface. It can be paired with all of the office package programs. In order to be used offline, it must be used as a desktop app. Cannot upload links in the shared service. Perhaps that's the only things that could be a "dislike" for the OneDrive. Aside these, it's a great program for sharing. Every company should use the OneDrive in order to organize, and make it fast the file shared services. It's easy to acquire and completely affordable. It will definitely make your and your company life better. Saving time and executing tasks with more dynamism. It's another way to simply share your files and documents for the whole group (company) without having much trouble. Integration is the word to use. "Great storage platform that works with so many of our applications"
The account and file management sections have a clean design with nice spacing and bold and clearly marked buttons and menu items. I can organize files in a simple and intuitive way, just as I would in my phone or computer. It's great that OneDrive for Business can work with so many of our web-based applications. We can upload files to our OneDrive hub to allow for more convenient access to everyone in our work group. I also like OneDrive's ability to open or limit access to certain files and folders. That makes it more versatile since we can use it for multiple unrelated work groups. A weakness of OneDrive for Business is that we need an internet connection in order to access our account and files. I usually have an internet connection, but sometimes when I'm on my phone, the transfer rates can be on the slow side. OneDrive for Business can help you broaden access to your files for many people, which can lead to easier collaboration efforts and higher productivity. Your team can also be on top of the latest file versions while minimizing unneeded communications. I've benefited from OneDrive for Business's online storage features. I can store lots of files online, which make them easier for me and my team to access them collectively. When we integrate OneDrive for Business with our marketing, productivity and collaboration platforms, we can share and access files in a more streamlined manner. File updates can happen in real time with the latest versions being available to everyone instantly. "Fantastic productivity suite for the Windows User... great backup option as well. SEAMLESS!" I really like that my Surface Pro device is entirely backed up and files are accessible via the Mobile App in a pinch. Sharing files seems to work with less issue as well [ie - dynamic spreadsheets, hi-res imagery, forms, etc]. 1TB standard, are you joking!? That's amazing! Honestly, I haven't found a dislike as of yet. As a heavy user of Google Drive, this is a newer product, but have transitioned over almost entirely due to its synchronized underbelly with Windows 10. If you're a Windows 10 user, this is a no-brainer. For peace of mind, back up your files... and enhance accessibility and sharing with cohorts and clients alike. Sharing large presentation files [ie - 100+ MB PDF files], backing up important files between home, office and on the road. Also, using Office Mobile within the program is a dream. Again, I haven't run into any issues as of yet. "Great Cloud Service...can be a hassle at times"
In general, the user interface is extremely easy to figure use and figure out. Both the mobile and desktop versions of the Microsoft apps are fluid easily accessible. File sharing is seamless (once you figure out how to grant access to those wanting to view or edit files). While the overall feel and usability is decent, since it is originally a PC program, the controls for Mac are a bit buggy at times. Especially with Microsoft Word, it does not allow for the typical shortcuts that are universally available in other Mac programs. At times, it also seems as if Microsoft is purposefully limiting ease of use - once again, this is just how it seems at times. Go for it. In spite of it's various bugs or difficulties, no program is perfect and without flaws. It certainly does what it's supposed to, and is perhaps one of the best options in the industry. Easy access to all Microsoft office programs, and easy file sharing. "Looking for Glitch-free and easy to use - Not OneDrive"
Seamless connection to the Microsoft suite. No one has to learn an additional program. - I feel like the online email vs the app for a phone vs the app for a computer are each bulky in their own way and really don't look much like each other. - Sharing of files is also bulky. I created a work around so my students can share to a joint folder, but the difference between it and Google Drive is once my students share to that folder, they documents live in two different places. - Shared Calendar access is only available online and not in the apps. So annoying. Make sure you find a way to work around problems before you fully plan to go all in. PLAN, PLAN, PLAN. For every major benefit I have found with OneDrive, I find one major downfall. The program has gone down countless times in the last 6 months and it seems like the issues get blamed on us and not the program. OneDrive for Business is a cloud storage service for enterprise or company usage. Having OneDrive for Business means that you will have the capability to save and store your files on the cloud. Saving files on the cloud mean that you can access it anywhere you need it as long as you have an internet connection. Microsoft OneDrive for Business can be accessed on different devices such as Windows-based computer, Mac Devices, iPhones and Android Phones. The only thing that I dislike about OneDrive for Business is its limitation when it comes to uploading a file. Even though it has a storage capacity of 1 Terabyte, users cannot upload a single file that will exceed 15 Gigabytes. This will be a disadvantage for users who want to store Outlook Data Files which can exceed the 15 Gigabyte file size. OneDrive for business is recommended for people who need quick access to his important documents anytime and anywhere. "Offers us constant access to our latest work files"
OneDrive for Business provides us with an easily accessible platform to the latest versions of our work files. Sharing files is straightforward and simple for others to work on or download. The user interface is sharp and spaced out to make various menu items, files and folders easy to find. We are given plenty of storage space and can work on Microsoft Office documents in the cloud. The pricing is higher than some other popular collaboration and file sharing platforms. There are certain files, like design-related files, that we can't work on very well through OneDrive. In general though, OneDrive is a simple platform that doesn't have much for me to not like. OneDrive for Business is a leading sharing a collaboration platform for good reason. It's not perfect, but does offer many valuable tools that can make collaboration easier and less stressful, especially when you work with people remotely. I often use OneDrive with my co-workers and clients to share documents and other files with each other. 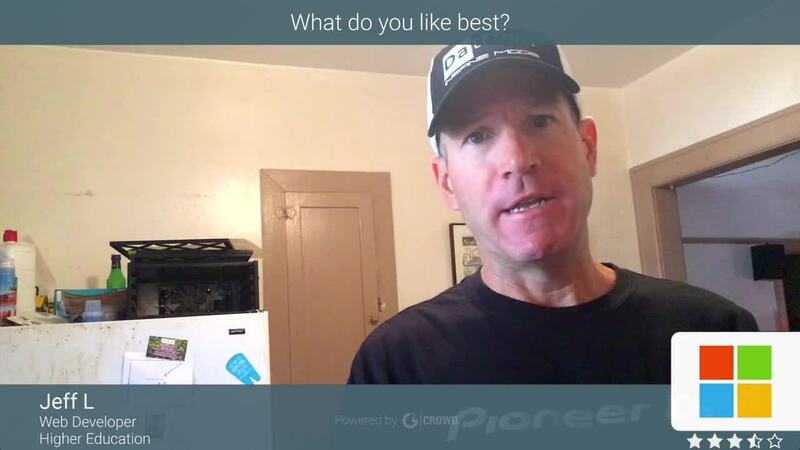 We can ask questions and leave responses and comments right within the platform. This makes our collaboration activities more streamlined since our communications are located within a single hub that everyone in a particular work group can access. For the most part, all of my work files are easier to keep track of and I'm able to stay better organized with OneDrive. It also connects with many business apps that I use, which greatly expands my data storage for files generated from those apps. "Sometimes too easy makes it forgettable"
Onedrive is connected seamlessly into the rest of Microsoft's tools. Better than all other file sharing services, Onedrive is essentially built into the product, making the ability to share files and open them a simple and almost seamless process. Onedrive's biggest benefit is also its biggest drawback--its immense integration with other Microsoft tools. Because it is something that is "just there," users often don't even notice it. Without a communications and re-education process in place to help users know that the tool is there and how to use it, uptake tends to be low. They ignore it and move on. This tool is very powerful. However, you need to have a plan on how to use it and properly educate your users on how to use it, as well as brainstorm with teams on ways to implement it to improve processes. Otherwise shadow IT will win and users will download Dropbox, etc., anyway. Onedrive helps us share and collaborate seamlessly on important files using standard Office software, mobile apps, and online all at the same time. "OneDrive for Business - Not just an ordinary OneDrive"
OneDrive for Business is not really the same as OneDrive. OneDrive for Business is meant for company use and have more features than OneDrive personal that is very beneficial for company use. The best part of OneDrive for Business is that it integrates itself with other Microsoft Office apps. OneDrive Personal can only integrate with Basic Office apps such as Word, Excel, Powerpoint and OneNote. But for OneDrive for Business, it can also integrate itself as storage for Microsoft Planner, Microsoft Forms and Microsoft Teams. OneDrive for Business is also an access-anywhere service since it can be accessed thru a desktop app, Mac Device, mobile app, or thru a website compatible on any browser. There are only a few things that I find OneDrive for Business needs to improve on. OneDrive for Business can have a log of who edited a file and the changes made on the file co-authored by another person. I would certainly recommend Microsoft OneDrive for Business for a company's, big or small, storage needs. It is not just online storage, but its also a way to collaborate with your team thru co-authoring of documents. On a company structure where we have limited storage on our workstation, OneDrive for Business really help us store more files and make it available anytime and anywhere. OneDrive for Business has a 1TB storage capacity which is more than enough to store our documents and Outlook Data Files. "Allows access to all project files at all times"
OneDrive for Business has a simple interface that is easy to navigate. I like that it gives me and my team a central location to collaborate on documents and other project files. The environment is very professional and helps to keep everyone in tuned to project activities with constant access to relevant files. The administrative tools make OneDrive for Business very versatile by allowing custom permissions for specific folders. The cost is a bit pricey compared to some other similar files sharing and collaboration platforms. There aren't enough collaborative tools that go above and beyond popular file sharing platforms. It would be great if there were more robust communications and task management features. OneDrive for Business is an excellent and highly recommended file sharing and collaboration platform, but if you're budget is tight, you may want to consider other lower cost platforms like Google Drive to first see if they are suitable for your particular needs. Otherwise, if your budget does allow for it, then I think OneDrive for Business is one of the best solutions. OneDrive for Business has been excellent for accountability and project management purposes. We reduce the need to send files individually. We can keep better track of file updates and generally get projects moving faster and with better results. 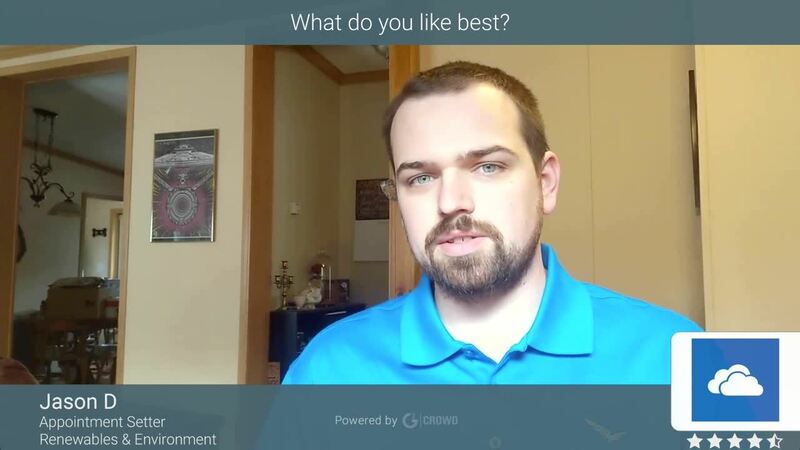 Many of the people I work with that join in on new projects find it much easier to get connected to new projects by exploring all the contents in OneDrive. "All my files safe on every device"
There are many Cloud Drive options but having 1TB of space is a strong point towards MS OneDrive. It works pretty well and allows me to access my local computer files remotely! Sharing is very easy. Search works perfectly and very fast. The app for iOS, iphone and ipad, are realy great and very simple to use. I have all my files sync between my PC and the cloud. So all changes I make on every device are always sync with all the others. You can even take the option not to have all the files downloaded on your PC and only the recent ones. That means that when you fetch a old document, it will donwload it from the cloud as you open it. That way it saves a lot of space on your small PC storage but still you have access to all your files easely.You can also switch very easy betwwen accounts withouth leaving the app. Onedrive is my all in one cloud storage app. 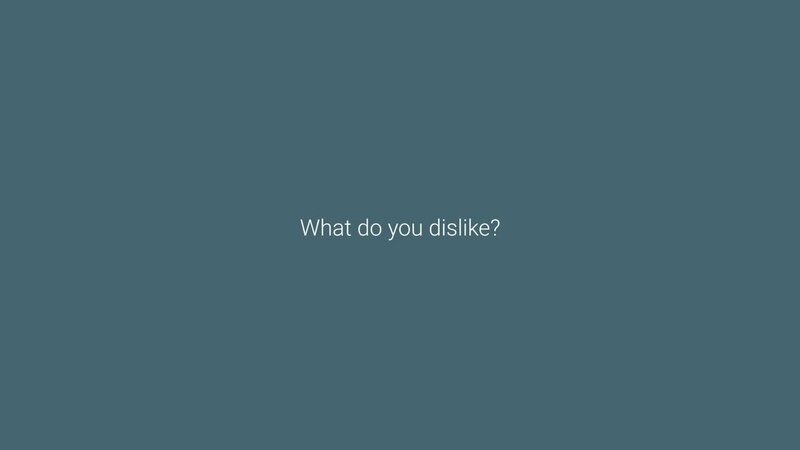 Dislike would not be the word, but perhaps extra features that don't occur me right now :-). Sometimes the login process can be a pain point because when the password changes you have to struggle to login at some point. It is not an easy process. To have all my files available on every device. Share all files with colleagues. Edit online. "Microsoft OneDrive for Business - Make your files on-the-go"
The best thing that I like about Microsoft OneDrive for Business is its accessibility. As long as you have a working computer, tablet or smartphone, you can access your files stored on OneDrive for Business either thru the downloadable application or from the website itself. Aside from that, you may set-up your OneDrive for Business application to allow you to fetch any files on your computer not just on what is stored on the cloud storage. OneDrive for Business as well have a bigger storage capacity compared to the personal one which is 5GB on a free account, 100GB for paid and 1TB for Office 365 subscriber. For OneDrive for Business, as long your company assign a license to you, you would instantly get 1TB storage space. The only thing that I dislike about the OneDrive for Business is its syncing issue on some of the files which don't normally happen. If you have a file that was left open on another computer, you won't be able to access the updated version of that file on another computer. OneDrive for Business is one of the great ways to access your files wherever you are. If you need to update a file anytime and anywhere, you just to place it on OneDrive for Business so you can easily open it up, edit it and re-upload it. One problem that we are experiencing before in our company is with regards to co-authoring a document that was made on a Microsoft Office application. Before we have to send the file to a person, edit it and send it back to you. But OneDrive for Business made it easy for us. Now we just need to upload the file on OneDrive and give permission to any who wants to edit the file. Now we can have multiple people who can work or co-author on a single document. "Expensive, But Helpful for Businesses"
My favorite part of Onedrive for business is the ability to see your documents wherever you are. Whether you are at home, school, or even in the doctors office, you can login and see the projects shared. Onedrive makes it possible for large businesses to share documents and projects within seconds. Everyone that can see it and has the ability, can make changes to it accordingly. Onedrive allows businesses to complete projects from across the globe, all with just an internet connection. My favorite part about Onedrive is the ability to share a document on my multiple computers. Instead of saving a document to my work computer, I can just save it to the OneDrive and so that I can see it at home on my laptop. OneDrive takes the place of having to carry around a USB. All of your files can just be simply saved onto the website. You and others, if allowed, can access these files anytime and anywhere. I don't dislike anything about Onedrive, it's a wonderful program for businesses working simultaneously on a project. Easy for new-comers, allows you to share files and projects with anyone anywhere. Onedrive takes the place of carrying around a USB for file storage. OneDrive can do it for you. Onedrive has made it possible for schools and businesses to finish projects at the same time with ease. File-sharing is at the click of a button and is easily accessible for people who are new to using cloud services. "A great solution for syncing"
It comes to be very handy when it comes to share and edit files with my co-workers online, allowing us to review the same file, regardless of its weight, that sometimes isn’t supported via email. Also, it’s very easy to upload files, documents, folders and even videos into the cloud. It can be done using a website or auto sync to the linked folder on the computer system. Having much of my information on the cloud gives me a lot of free space on my hard drive, so I can give a more productive use of it. My organization has over 150 employees and at least 80% of them have access to OneDrive for business, but I found really difficult to mix them up on the same folders. I think the platform needs to solve this problem when it comes to a great amount of users. A common complaint we have on the IT department is that is has no resources for developers. It is not a bad option when it comes to syncing and sharing files for small and medium companies. OneDrive for business is one of our more useful platform when it comes to share files with our employees, between departments and with some of our collaborators from outside the company. This platform allows for easy and quick audits and scanning, which is needed in case of big projects where the integration of activities of several professionals is involved. "A progressive and diverse development to your projects." Something I really like is the email functionality integrated into OneDrive, this gives a more personal side of the sync of our information. Besides, and I think this is its best features, it allows everyone involved to edit and collaborate with files I have uploaded, giving a progressive and diverse development to my projects. This is a good platform to make backups in real time. I consider it is great for small companies, where there is no need to share too many files and the space required on the cloud is not too large. I work on the Marketing department and I give a regular use to OneDrive to save data, especially for our clients, that I need to be available all the time and that I can access of from everywhere with any device I got, and Onedrive allows me to do this. It doesn’t just work well, but it is one of the most known platform when it comes to share files, so it is very used for most of my clients and co-workers. "One cloud data service overview.Drive"
Many often bored run for a USB cord to download to or telephone any information, be it music, photos, videos. And OneDrive will make your life easier, because it is not only a great online storage with available memory of 30 gigabytes . With OneDrive you can literally instantly transfer information from your PC to your phone or Vice versa. As the site and the application on android nice and very simple design.OneDrive created by Microsoft and not on the website not on the application there is no advertising (as their products and others) and this can not worry about the reliability of the "walls" of the program. I have been using this program for a long time, and all the photos that I do for the Reviewer I do on the phone, and transmit only through OneDriv. And again, the same 30 gigabytes for a phone with constant Internet, well, just great. On the amount of storage plus. Terribly slow, constantly writing about some problems sending files that have not even changed. Synchronizes through times and not on time. Can not send changes to the server or write that everything is updated, forgetting to update. Loads the system. Very much loads the processor even in idle mode. It is not clear what he is doing with this amount of resources. It is better to set yourself something else. Anything. OneDrive for business and Office 365 make it easy to share and collaborate on any file with others. The Android, iOS and Windows Phone apps all have automatic photo uploads, meaning that when you shoot a photo with your phone, it's automatically saved to your account. OneDrive's biggest strength is that it works closely with Microsoft Office apps, such as Word or PowerPoint, so when you launch one of those applications you'll see a list of recent documents saved to OneDrive. If you have an Office 365 subscription and open a document saved in OneDrive, you can collaborate on it in real time with other people. In late 2015, Microsoft made an announcement that it would no longer offer unlimited cloud storage to Office 365 subscribers. Instead, they are limited to 1TB. Additionally, beginning in early 2016, the 100GB and 200GB paid storage plans will be discontinued, replaced with a 50GB for $1.99 per month plan. You will no longer get extra space if you allow the OneDrive apps to automatically backup photos on your phone. If you work with sensitive information that really must be kept secret, Microsoft’s relationship with the NSA and may be unacceptable. A bigger concern is that consumer files aren’t encrypted in the cloud. Really the decision is yours, although if you’re using Windows 8.1 or Windows 10 you’ll have to uninstall OneDrive manually. Works seamlessly with Windows devices because it's built into the Windows operating system. "OneDrive enables effortless backups and file-sharing"
OneDrive's continuous backup functionality ensures that the data and files I need are always safe. I once had a work laptop stolen from me, but restoring all of my data to a new machine was incredibly easy, because OneDrive had backed up every last one of my personal files. I had a new machine restored with my backed-up files, and lost zero files as a result. I can also share large files and collaborate with my colleagues my sharing my OneDrive copy with them. As files upload to the OneDrive server, there is the occasional conflict when a server copy is different than a local copy. Or, sometimes I am unable to use a file while it is uploading to the OneDrive server. In our organization, we are using OneDrive for Business on all issued machines to ensure data and files are securely backed up. This integrates very well with the other Microsoft products we use daily. Files are continuously backed up and can be shared via OneDrive's online service. "Onedrive Business, best cloud drive platfrom"
Does not translate well for our people that use screen readers. Also does not translate well to Braille, or back into text. We've had issues where words would be jumbled up into gibberish. Will sometimes freeze, or lag behind if more than 3 people are viewing/editing a document at once. Windows 7 support - The office system that I have is Windows 7 and when I use it, sometimes it doesn't sync. I don't know whether this is because it's Windows 7 or if it is a RIT network problem. There should be an option to select one folder and manually sync in case the automatic sync isn't working. Once I worked on something and somehow the synchronization did not happen, so I had to create a dummy folder and delete it for the software to detect changes being made. Some offices have Windows XP, Vista etc., installed, which might make it little but more harder to use OneDrive. Another situation is when a person has more than one account. I haven't seen any options to integrate two different accounts in the same computer. In an office space where sharing and collaborating is important, OneDrive works best in saving time. OneDrive was a great investment for us so that we were able to share documents and information that anyone could add to or use for their presentations and cases. My role in this is promotion on social media and facilitating communication, and OneDrive was amazing so that if there was an event being hosted or an online conference, fellow head volunteers could upload summaries and pictures for me to then organize and post almost immediately. One Drive makes it easy to manage Microsoft office documents , store data, and access from anywhere. It's secure and reliable even on the go from my mobile device to desktop. I like that any mobile device on the market can have access to it, ranging from laptops, tablets, mobile (iOS and Android) and integrates so well with Microsoft suite. I have nothing to negatively say about OneDrive. File sharing is the key issue we are solving by using OneDrive. The most beneficial functions of it is how well it helps retain the integrity of files created using the Microsoft suite. Like many other clouds, this makes it easy to share and access cross-collaborative work. "OneDrive - a matured cloud provider"
"Great program for storing documents"
I like this software because it is synchronized with the Active Directory user, as well as helping the user to use any machine without worrying about saving the document on the network. It is lightweight and does not need a robust computer to run the program. To the present moment of use, I did not find anything negative in Microsoft OneDrive for Business. I recommend everyone to use this program, it is fast, easy to use and still assists in switching computers, without having to make multiple backups of the data. In addition to presenting a low monthly cost. When it was implemented, it helped mainly in the exchange of computers (leasing), where we did not have to worry about backing up data on the external hard drive. He also helped with the local server, where most documents are saved in the clouds. "Save your files in the cloud"
OneDrive allows you to store your files quickly because you can have the desktop application for windows and directly there drag your files and folders and automatically upload them to the cloud, you can realize when the files are stored in OneDrive because the side of each folder you will see the drawing of a cloud with blue relief. One of the great advantages is that the application exists as for IOS and Android and you can access the application from anywhere in the world with an internet connection or data, so you will always have access to the files that you consider most important. To be able to increase the storage capacity of OneDrive you must obtain an office 365 subscription and they give you 1TB of storage. I currently have storage capacity of 105 GB thanks to a subscription I had from samsung, but only valid until 2020, what will happen to my files after this date? The truth is that I have no idea. OneDrive is one of the great storage bets by Microsoft in which you can have total control of the files, photos, videos or music you store. Apart from viewing them through an internet connection, you can share and download the files stored there and have them locally on your device; without having the need of an internet connection. The best benefits you can get from storing your files in OneDrive is that you have the facility to take them anywhere in the world, whether accessing from a desktop, laptop, tablet or smarphone. "OneDrive is highly efficient and secured cloud drive with reliable features. " OneDrive has easy features to upload and manage the content in the drive. It also offers enough storage at cheap subscription packages to regulate all the professional files and folders. This drive can also be used as a backup drive to save and secure the important files and content. Additional security , comes with mobile and email notifications. OneDrive has proven to be quite productive for us by bringing efficiency in sharing professional files and connecting with the colleagues. OneDrive is integrated well with microsoft account, but the user-interface is somehow complicated to use. The uploading speed of content into this drive is also quite slow as compared to google drive. All other features are working efficiently providing reliable services. OneDrive is always my top priority to share files and folders with the professional community. Due to its professional outlook and fast access , it is a reliable tool to use as a storage drive . OneDrive has also kept in storage most of my essential files which are required every now and then for professional work. Overall, a great and trustworthy tool. "My favorite software to keep my data and information." I am a huge fan of one drive. It not only helps you to create your data, but also assists in storing it. You can share your data with your colleagues as well. So by just one click away you can make, save and share. Thus a great platform to work with. So far I am using this application, I have found no difficulties with this app. It is simply easy to use and very time saving. It is a great software to use and you can found everything in just a click away as all softwares of Microsoft are connected. So you don't have to make new IDs in all. thus it is very time saving. For business, one drive is also connected with other microsoft softwares. I am a teacher and it helped me to connect with my boss who is in another city and called him right away and edited my file and submitted it. Thus onedrive saved my life and job. "Great cloud to share all your files"
Excellent cloud that synchronizes with all the programs of the Office suite. OneDrive offers great benefits when sharing a file or document, and you can add any file in any Office extension. Great mobility offered by this cloud can access all my files and shared from my smartphone, having support for both Android and IOS. It is super easy to configure the whole graphical interface and I like the sobriety in the colors and the schemes used. Uploading files is extremely fast and the capacity offered in the business version is overwhelming. The security is not fully strengthened, I would like to have double authentication to enter Onedrive since from this platform you have access to many files that can be private and with a single attack all the security of the cloud is violated. Sometimes there are problems in the synchronization of files in the groups, there are cases of documents that are not loaded correctly and must be placed again. Use Onedrive if your company relies on Windows as the operating system, the synchronization is perfect with every element of Office. If security is paramount to you, think of another cloud or look for a way to add another layer of additional security in user authentication. I use Onedrive to share everything with the rest of my colleagues, distribute lists, manuals, files, budgets, etc; It is much easier with this application. Also with the large capacity of 1 TB per account you can have a lot of information without needing to buy more for the moment. Since Onedrive is completely synchronized with Windows, making a Word document and sending it to another department is really simple. This is my first time using Office 365 and any of the "One" products. I do like that it's convenient to have all of my Microsoft Suite files in one place. I try to be organized but this provides a great way to assist with that. Its so easy to add files and documents into the one drive folder and then if I'm on the go and don't have my work computer with me I can access the documents from my phone! I'm all about convenience! I would say if you aren't sure how to use it there are good support tools within the software itself and there is always Google! Staying organized and keeping files in one place. I don't normally take my work laptop home and so its great that I can easily access my work files from my phone in the even I get a call about something. What isn't there to like? Do you like storing your information on the cloud? Do you like huge amounts of storage to the cloud? Do you like being able to sync your cloud storage to your computer? Well, OneDrive does it all! I am a Google person, and I switched from using my Google account for cloud storage to using OneDrive exclusively. The ease of set up and the functionality is flawless, especially as a professional. There isn't much I don't like with OneDrive. I think the only potential drawback is that OneDrive is a Microsoft product. Some users don't like using Microsoft products for one reason or another or don't like the permissions involved. Other than that, there are no real negatives to write home about. OneDrive for Business is a one-stop-shop for your cloud storage needs! I am able to use OneDrive to store all my files across multiple workstations all with the ease of a login. I can get a file from anywhere in the world in seconds and the sheer storage amount I get is fantastic. I don't see myself using anything else. I like One Drive because it makes storing files easy and accessible. I can access my files at any computer or device that I am logged into. I no longer have to worry about carrying around flash drives or storage devices. It also frees so much space from my computer's hard drive which I was having a problem keeping free space available on my computer. Since using OneDrive I have not have any problems or issues with using it. It is very user friendly and simple to start using on all my devices.There is so much storage space that I can not foresee me ever having an issue with storage space ever. I recommend anyone to take advantage of using OneDrive. It has really helped me keep all my electronic files in one place. I can access them from any computer or device. It also allows you to share documents with other users, making it easy to collaborate on different documents and projects. Microsoft OneDrive allows me to solve the issue of running out of space on my computer's hard drive. It also solves the problem of me having to remember to carry around a flash drive or storage device. This has tremendously helped me to save time and become more efficient. "More than a simple email service"
OneDrive for business is an incredibly fast tool, I can access hundreds of documents, in the cloud, in an instant way, and work with anyone, who owns the different Office tools, we can update and see the plans of our roads in real time, send maps and detailed routes to our drivers, who can see in their mobile devices, they also share us, real-time images of what they are seeing on the tracks, all thanks to OneDrive's fast connections in the cloud. Some files that are not from the family of applications of Microsoft applications, sometimes are not compatible, and we must observe them, in other applications external to OneDrive. We can have hundreds of documents and maps online at hand, to solve different problems, which our drivers have on the tracks, observing the best routes they have at the moment, if they need to make a detour, before it was impossible, to have so many documents to hand, but since they were digitized and are in the cloud, thanks to One Drive we can access them immediately. "OneDrive is the most secured cloud storage with reliable sharing." OneDrive is a fully secured and encrypted cloud storage with whom I can entrust all my private and confidential files and data. This Drive supports easy to manage and upload files which supports all kinds of formats of files and docs. The access is also easy available and one can easily get approved account within minutes. OneDrive at first hand, Offers only a limited storage space , which in long run gets short and additional storage have to be bought for additional price. Also, the sharing of zipped files are somehow difficult to get done. Onedrive is a secured drive for efficient storage of official and causal documents and files. It's quite affordable and easy to use drive with immense benefits. With Onedrive, I am fully capable of circulating the business docs with our clients as well as professional colleagues. The ease of using it for professional deliverance of docs and information in a fully secured and reliable way are the perks of using OneDrive. I love the fact that files can be saved anywhere, anytime - you can upload any format of documents and save it instantly. The files are accessible on any device which has OneDrive almost instantly after uploading. It has proper folder structure (like Windows) and easy to keep files organised. There's also a mobile application on both iOS and Android, making it easy to send/receive files from your mobile device. It also offers 15GB of free storage when you first sign up, with a possibility of earning extra storage space, free of charge! It is definitely THE best cloud drive available right now. There's not many dislikes I have for this software. The only concern I have is the unoccasional syncing glitch that sometimes occurs. Files sometimes don't sync fast enough and you turn your device off - these files won't be avilable on your other devices until that device is switched back on and completed the sync. OneDrive should properly notify you when something hasn't synced and you exit the application, this can cause problems. 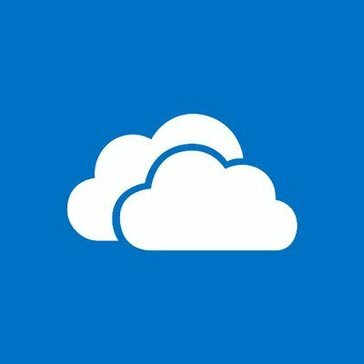 I'd definitely recommend OneDrive to anybody who's looking for a cloud service, it's by far the most superior cloud on the market. It has all the essential features you would ever need and it's integrated with Windows 10. I'm using OneDrive to share files of various formats with different employees at work, and for my personal life also. The files are easy to organise and I always feel super confident knowing that my files are supported on a cloud, and aren't subject to things like hard drive failure. Files can be saved and accessed anywhere internet is available. Especially on a PC, OneDrive can be downloaded, making it fast/easy to drag and save files or drag and download files e.g. from the Desktop to OneDrive folders. This process takes less than three seconds as opposed to accessing OneDrive on the web. It is very easy to search for saved files. Sometimes there are glitches and it doesn't sync properly between the content on my computer and the server. My IT department is unsure why that happens. They usually fix it by remapping the OneDrive folder(s) to make it clear everything off my computer and sync the entire drive again. Microsoft OneDrive works best when the majority of users in your organization use it. This will make it easier to share files with one another via links, as opposed to emailing files back and forth. Anyone who has been granted access to the Drive can access it anywhere. Any changes made are saved instantly. As a result, files do not have to be emailed back and forth but can be instantly accessed by those who have been granted access to the Drive. This obviously saves time and is very convenient. For those who work from home, they can securely access OneDrive content by logging in via the internet. They do not have to carry their work computer back and forth. This makes it possible to work on work anywhere and any time. "Availability and security of information"
Microsoft Onedrive for business is an extremely powerful and flexible tool for the distribution of content in business environments, in my personal experience both in terms of administration and use in our company, in terms of implementation, administration and use of the same, it was and has been very easy and without generating any type of impact, in the same way it has improved both the availability of the information, as well as the security of it, and has allowed us to streamline many processes that were previously quite complex. 1. Centralized and rapid distribution and administration of manuals and applications to our technical force outside the office. 2. Availability at any time and place of the information that our board of directors needs. "The best file sharing app!" The simplicity of the interface is one of the best features of the app. Can be used in all of the microsoft office 365 programs. The price is also something attractive. In order to be used on "full potential" it has to be linked with the sharepoint, which is a negative side, since not everyone has access to the SP. To use offline, you must use desktop application. Need update to not depend on the SharePoint program. Aside that, it's a great, if not the best program in file sharing services. The benefits are the file sharing simplicity, and the integration of the hole microsoft office 365 programs. The only problem is when we don't have access to the SP (sharepoint) and then, can't use 100% of the features of the One Drive. "One Drive- Cloud storage share path"
- It is a very useful tool. It easily sync’s all the data files from your device like from Desktop, Downloads, Documents and every other profile to one drive. - It immediately sync everything to cloud from internal storage. - When In some scenario such as system break down or need to create profile on another system in such cases we just need to create a new profile and sign in into one drive and this is how they can have access to all the files which was synced. - It is affordable cloud based backup service tool. - It is good for single user and small organizations. - Mobile application is also always align with the Web version. you can also keep updated with mobile and tab too. - there are very Limited reporting tools. - It is not good for the large scale organization. I would recommend this product to small scale organizations, people who don't have lot to share internally and need less space to store data. - In our company, we use one drive to share training videos with everyone in the organization. Share knowledge, information and many other important documents. "Glorified FTP Site; Not yet up to par with Google Drive"
I like that they follow the same model of Google Drive. They seem to be on the right track for the most part. I also like that you can install the application on your computer. Like anything Microsoft, you need an instruction manual to use it. They focus on making everything full of features professionals don't use. Dont' be afraid of change when it's for the better; consider replacing your Microsoft subscription for a Google for Business subscription. Look into it and know that it's where the future is taking us. Our company wants to go server less in the near future. We like that we can keep our filling structure and files in the cloud and have more functionality than a server including information on who created the folder, and who was the last person to access it. "One dirver the microsoft cloud to save files"
One driver an easy way to automatically backup the photos of the camera in the Android application this is one of my options that I use the most. There is also the possibility of expanding the capacity of our OneDrive account free of charge up to 5 GB. You have the possibility to save everything you want and make folders about the files. in my experience I use it to keep important files of the company to presentations that I can easily share via invitations and you can see it from the cloud of one driver, I also share information about documents and excel files. what I dislike is that you must pay to expand the 5 GB. my recommendation with my experience I use it to save the files I use daily and it helps me full access in all parts of the world with Internet access, so I say it is useful because it avoids having a physical storage such as pendriver or external disk among other storage devices, we avoid this inconvenient and you have it at hand from the cloud, it is a useful tool and easy to use. in my experience I use it to save the files I use daily and it helps me full access in all parts of the world with Internet access, so I say it is useful because it avoids having a physical storage such as pendriver or external disk among other storage devices, we avoid this inconvenience and have it at hand from the cloud. "Best Overall Cloud Storage Solution for Windows Users"
Overall, Onedrive for Business is an overall great value. Onedrive for Business provides two platforms for customer's to utilize There's a web interface for uploading, downloading, and managing files and permissions allowing the ability to share with other users. For some more old school individuals, the seamless Windows 10 integration allows simple drag and drop from one folder to another to upload. It's also great for business's with the need to lock down file access and prevent files from being accessed outside your organization. The sharing and permissions is still buggy at times. Because OneDrive for Business is essentially a private sharepoint file sharing site, your permission settings can become confusing and hard to manage. I've noticed problems with sharing with users outside of my organization and random links suddenly not working, or not working across all platforms. I've found its crucial to follow Microsoft's recommendations with setting up Onedrive or any Microsoft cloud product. If its not setup correctly, the problems will follow you across to other integrated services. Onedrive for business offers a centralized location for storing files necessary to run my small business. I use it to share files with clients, and to be able to access files with on location. I love the convenience of OneDrive. I can access my files from any device or multiple computers. Plus, I know my files are always backed up. I also like the ability to quickly view a file online if I don't need a ton of features I can make quick changes right there. Sometimes saving files can be a bit sluggish. If there are a lot of formulas, tabs, calculations, etc. in and Excel workbook it can take quite a while to save the file as it recalculates all the formulas. Make sure you pay attention to dates of the most recent file update and who made the last changes so that you know you are always working with the current file. Our company uses OneDrive for file sharing. We all have access to everything we need at a moment's notice. If someone updates a file, it will let you know when it was last saved so you can always make sure you are working on the most recent file. "We Couldn't Run Our Business Without It!" We are all remote and need to be able to share documents. This allows us to have public and private files without loading up our computer hard drives and relying on e-mail. It is always quick, never freezes, and I've never lost data. Honestly, I can't think of anything I dislike. The only thing that can be a little frustrating is that sometimes files can sort of get lost and you have to dig to find them and move them to the correct folder. I would die without Onedrive Notes! Everyone who is a note taker should definitely get the OneDrive suite. Connecting our company is not an easy task. We are spread out all over the west coast and only 3 of our guys are in are central office. The rest of us work from home. This allows us to keep all our reports in one central place and not lose any information if a computer crashes. "Good way to share files "
Useful to share files while giving presentation instead of storing it in outlook. Also, easy to access , no need of multiple drives to share files with different departments. You can control who can see those files. Not much as of now as its been only a few months that I have started using it. Very Convenient in usage across the network. With so much storage available, I rarely use my local drives for file storage. I can easily use my large files for all presentation purposes just by logging into the network. Also, sharing a file with users is very easy. It syncs easily with SharePoint. I can sync the file with share point and it easily handles the updates between one drive and SharePoint securely. With Enormous cloud storage available, I dont think I would run out of space anytime. Replaced multiple drives and used it in single drive. ease of use. When computers unexpedly crash and have not been backed up for a while, onedrive comes in handy. It auto upoads your files fo ryou dso you do not have ot manually backup your computer ever again. IT automatically and quickly uploads all secure data. "Accessible File Storage and Sharing"
All our documents are backed up on the Cloud, so I don't have to worry about what would happen if something happened to our hardware. I also don't have to worry about progress being lost if we don't manually click save since it saves automatically. I honestly don't have any personal critiques of OneDrive. Older people in our office sometimes struggle to get into the shared folder, but it is easy enough to guide them. I can share a folder containing our most used files with all office staff so everyone has access to the most up-to-date versions. We can also collaborate on projects more easily since it syncs automatically. I used to host all of the documents for our small business on my computer and anytime someone needed a document, I had to either send it to them or print it myself. This alone has saved me a lot of time. "Great File Storage & Collaboration Tool for Small Business"
It is easy to use and allows all employees across multiple offices to share documents. Also, the ability to access documents from various devices easily provides greater efficiency among our small organization. The ability to share documents among different employees or all employees is a great feature. For example, we have some documents/folders that all employees can access and then others that just the executive management team can access. I like that the files are located in the cloud so we won't have to worry about a hard drive going out. We had some bugs with the software when we first started using it and because of this some employees have been slow adapters. We don't always sync all of our documents/folders due to the size and the drain it can put on our computers. Highly recommend this product for a small business that is looking for a low cost solution for file storage needs. Greater efficiency in accessing documents and the ability to collaborate easily among employees working in different locations. OneDrive has decreased the need to email documents to users and then have different versions of documents floating around. Prior to OneDrive, we used an external hard drive for file storage but the hard drive crashed and that is when we found that the redundant drive had some issues as well. We had to hire a company to get the data from the drives. We are a small company with no IT department so having OneDrive for Business works great for our organization. What we like most about OneDrive for Business is how easily compatible it is with Microsoft Outlook, which is the platform we use for Emailing systemwide. Essentially there is no set-up involved, and everything syncs with incredible smoothness. We never have an issue with storage capacity, and we can always monitor whether or not teams have access to what we need. The biggest dislike of OneDrive for business is with the Microsoft platform over all. The cloud version of documents, excel, and other programs doesn't allow for smooth editing and there's always loading delays associated with this cloud feature that we don't seem to have an issue with when using Google Drive and Dropbox. I would say whatever could be done to improve processing performance, but perhaps that's a local issue. The biggest business problem we solve is cost. Because we're able to use OneDrive with our Microsoft Outlook agreement, we don't need our entire network of 500+ employees using and paying for Dropbox. Instead, OneDrive carries a heavy load of this work and allows us to exchange documents like lesson plans for review. Learning about Microsoft OneDrive for Business? * We monitor all Microsoft OneDrive for Business reviews to prevent fraudulent reviews and keep review quality high. We do not post reviews by company employees or direct competitors. Validated reviews require the user to submit a screenshot of the product containing their user ID, in order to verify a user is an actual user of the product. Hi there! Are you looking to implement a solution like Microsoft OneDrive?